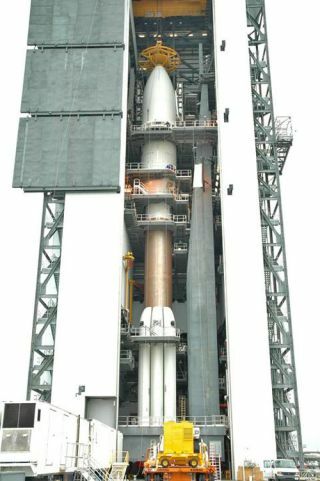 NASA’s New Horizons probe sits atop its Atlas 5 rocket at Cape Canaveral Air Force Station in Florida. A NASAprobe bound for the planet Pluto and the distant icy realm of the Kuiper Belt is spending its final days on Earth as it nearsits Jan. 17 launch date. "We're ingreat shape," NewHorizons principal investigator Alan Sterntold SPACE.com this week. "We have a very clean vehicle." New Horizonscleared a Flight Readiness Review Thursday as the days tick down toward liftoffof the first-ever flyby mission to Pluto, mission officials said, adding that aseries of mission news and science briefings will be broadcast on NASA TVbeginning at 1:00 p.m. EST (1800 GMT). Rollout ofthe spacecraft atop its Lockheed Martin-built Atlas 5 rocket is set for Mondaymorning at its Cape Canaveral Air Force Station launch pad in Florida. Booster fueling to follow shortlyafter, NASA officials added. Thespaceflight's launch window opens at 1:24 p.m. EST (1824 GMT) on Jan. 17 andruns through Feb. 14, though the spacecraft must lift off by the end of Januaryto take advantage of a gravity boost from Jupiter that could shave three yearsoff its spacecraft. If all goes well, the probe should swing past Pluto and itsmoons in 2015, researchers said. "Everythingis very positive and everybody is getting very excited," said David Kusnierkiewicz, New Horizons mission systems engineer withthe Applied Physics Laboratory at Johns Hopkins University,which built the spacecraft for NASA. "It's a good feeling...all the officialapprovals are in." NASAofficials confirmed this week that the White House's Office of Science,Technology and Policy (OSTP) gave its final approval on New Horizon's radioisotopethermoelectric generator (RTG), which converts heat from decaying plutoniuminto power for the Pluto spacecraft. The RTG isa leftover spare from NASA's Cassini spacecraft, which is currently studyingSaturn and its many moons, Stern has told SPACE.com. Stern saidthe New Horizons probe's Jan. 17 launch target also happens to coincide withthe anniversary of the death of Pluto discoverer Clyde Tombaugh, who firstobserved the distant world in 1930 and died in 1997. "It's acomplete coincidence, but interesting," Stern said. The launchis also bounded between the 100th anniversaries of Tombaugh's birth (Feb.18), as well as that of Gerard Kuiper (Dec. 7) -after whom the Kuiper Belt and its objects are named.Family members of both Kuiper and Tombaugh areexpected to be on hand for the launch. Both Sternand Kusnierkiewicz don't plan to relax once NewHorizons launches on its way, and will head immediately to the spacecraft'smission control center at the Applied Physics Laboratory in Maryland. "This thinghas been a lot of hard work and it's gratifying to get to this point," said Kusnierkiewicz, who has spent the last five years watchingover the New Horizons spacecraft. "It's kind of exciting that first all thishardware starts to show up and then one day, you turn around and it's at thelaunch site."